The second session of the 100th General Assembly is underway. Here is a summary of issues of interest and importance to ophthalmology and the medical profession in general. Although optometrists and the Illinois Department of Professional Regulation sought in 2016 to add a number of surgical procedures and medication by injection to the optometry practice act, the General Assembly passed the optometry licensure sunset renewal without those provisions. However, a 4-member "Task Force" with two optometry representatives, a delegate from ISEPS and a delegate from the Illinois State Medical Society was created to examine the issue of whether "advanced optometric procedures" could be added to the scope of practice, what those procedures would be, and what educational standards would apply. The Task Force met monthly throughout 2017 but ultimately came to no conclusions. On December 29, 2017, the Illinois Department of Financial and Professional Regulation published a proposed rule that would expand the optometric scope of practice to include seven surgical procedures and administration of "ocular pharmaceuticals" using three methods of injections. The "First Notice" period for the rule ends 45 days after publication... February 12, 2018. Members of the public and interested parties may submit comments about the rule before that date which will be compiled and reviewed by the Joint Committee on Administrative Rules (JCAR) before the rule is approved, rejected or returned to the Department for revision. Have you met with a member of the General Assembly? Please submit this visit report. 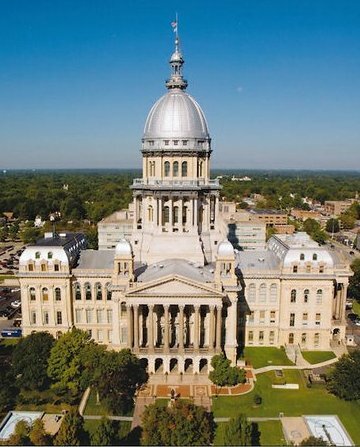 SB 3607 (Harmon) - Proposed legislation defines surgery, defines "advanced optometric procedures"
HB 5078 (Bellock) -- Requires first-time applicants for an Illinois drivers license to submit a "vision specialist report" from an optometrist, an ophthalmologist or a physician. This bill was TABLED on 4/12/18. HB 4995 (Crespo) -- Requires development of a uniform prior authorization form for prescription drug benefits in insurance plans. HB 4704 (Scherer) -- Original bill reclassified hydrocodone to be a Class I controlled substance. House Amendment 1 replaces that with language creating a task force to study prescription opioid abuse in the state, to study the over-prescription by physicians of opioids such as Hydrocodone and Oxycodone; and recommend whether restrictions on physician prescriptions of opioids should be enacted, as well as any other legislation that would have the effect of reducing opioid addiction and abuse.